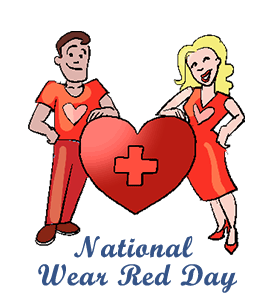 ﻿National Wear Red Day: Calendar, History, Tweets, Facts, Quotes & Activities. National Wear Red Day is a holiday dedicated to raising awareness about heart disease. According to the National Heart, Lung and Blood Institute, 1 in 4 women die from heart disease, and coronary heart disease is the leading cause of death in both men and women. National Wear Red Day was established by the American Heart Association and National Heart, Lung and Blood Institute in 2003. The day is celebrated annually by wearing red color to represent the fight against heart disease and stroke in an effort to generate awareness and initiate change. By the 13th anniversary of the National Wear Red Day, the campaign had achieved many positive goals including these statistics: more than 33% of women in America have lost weight and more than 50% of American women are more physically active. National Wear Red Day is celebrated on the first Friday of February annually. 1 in 4 deaths in America are related to heart disease. In 2017, goredforwomen.org reported that since the first National Wear Red Day in 2013, close to 90% of women made at least one healthy change in their behavior, over one third lost weight, over 40% checked their cholesterol levels, death in women decreased by more than 30% in the ten years prior to 2017, and other positive developments. Raise awareness for heart disease research. Volunteer with the local heart disease fundraising organization in your area. Wear red on National Wear Red Day to raise awareness of heart disease and stroke in women. Visit your family health physician and get a blood pressure, body mass index and cholesterol tests in order to further discuss your exposure to heart disease and take preventative measures. To prevent heart disease, get at least 30 minutes of daily exercise. Opt to head out for a brisk walk, a light run, swimming or biking. Purchase one of many watches or download aps that monitor your daily steps, heart rate and food consumption. Garmin and Apple both sell watches while aps such as My Fitness Pal and Runkeeper monitor steps and food consumption.